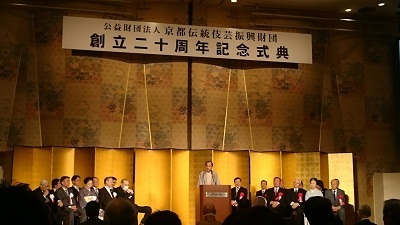 Many people who have been supported the culture of Kyoto attended the ceremony. 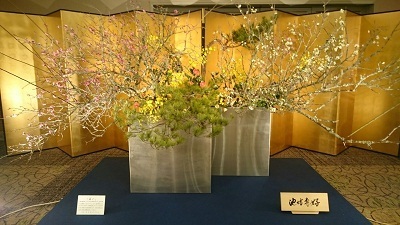 I attended “20th anniversary” of Kyoto Traditional Musical Art Foundation on January 15th. The foundation is called by the nickname “Ookini Zaidan”, and they preserve and inherit the culture and tradition of the Hanamachi (“flower town” or “geisha district”). They organize various performing events and activities in the categories such as “kyoumai (= dance)”, “Gagaku (= music)” and “Sado (= tea ceremony)” to provide the opportunity for the people to feel Kyoto culture. I could attend a lecture titled “Kyoto, from the perspective of 13.7billion years history of the universe” which was planned as a part of the anniversary ceremony. It made such a special experience for me. This experience motivated me to spread Japanese culture and beauty in depth not to mention Kyoto culture, and also the mindset of “OMOTENASHI” through our wedding service.